Acute viral respiratory infections are an important cause of morbidity and mortality in humans worldwide. The etiological backgrounds of these infections remain unconfirmed in most clinical cases. The aim of this study was to estimate the prevalence of human coronavirus infections in a series of children hospitalized with symptoms of acute respiratory tract disease in a one-year period in Slovenia. The 664 specimens from 592 children under six years of age hospitalized at the University Children’s Hospital in Ljubljana were sent for the routine laboratory detection of respiratory viruses. Respiratory viruses were detected with a direct immunofluorescence assay and human coronaviruses were detected with a modified real-time RT–PCR. HCoV RNA was detected in 40 (6%, 95% CI: 4.3%–8.1%) of 664 samples. Of these specimens, 21/40 (52.5%) were identified as species HKU1, 7/40 (17.5%) as OC43, 6/40 (15%) as 229E, and 6/40 (15%) as NL63. Infection with HCoV occurred as a coinfection with one or more other viruses in most samples (70%). Of the HCoV-positive children, 70.3% had lower respiratory tract infections. The results of our study show that HCoV are frequently detected human pathogens, often associated with other respiratory viruses and acute respiratory tract infections in hospitalized children. An association between age and the viral load was found. The highest viral load was detected in children approximately 10 months of age. Acute infections of the respiratory tract are a major cause of morbidity and mortality in humans worldwide and approximately 80% are caused by viruses [1, 2]. The viruses most frequently associated with respiratory tract infections include respiratory syncytial virus (RSV), parainfluenza viruses (PIV), influenza viruses (Flu), adenoviruses (AdV), human rhinoviruses (hRV), and enteroviruses, and less commonly, human metapneumovirus (hMPV), human bocavirus (HBoV), and human coronaviruses (HCoV). Until recently, it was believed that HCoVs were responsible for the common cold syndrome and were the cause of only mild upper respiratory tract infections (URTIs) . After the SARS epidemic in 2003, it was established that these viruses can also be associated with severe, life-threatening, or even fatal respiratory infections . Stewart at al. have also suggested a possible relationship between HCoV infections and the development of extrarespiratory symptoms, including some involving the central nervous system . The role of HCoV in human gastrointestinal infections also awaits more detailed exploration [6, 7]. The aim of this study was to estimate the prevalence of HCoV in a series of hospitalized infants and young children with symptoms of respiratory tract disease at the University Children’s Hospital in Ljubljana from June 2007 to May 2008. The main focus of the present study was to detect all four human coronaviruses in hospitalized children. A proportion of the patients included in this study have been partially described in a separate publication . From June 2007 to May 2008, 897 respiratory specimens from 741 pediatric patients hospitalized at the University Children’s Hospital in Ljubljana with acute respiratory tract infections (ARTIs), were sent to the laboratory of the Institute of Microbiology and Immunology, Faculty of Medicine, University of Ljubljana, for the routine detection of respiratory viruses. The number of patients included in this study represented virtually all of hospitalized children with diagnosis of viral respiratory tract infection in this period. Of these, 664 (74%) respiratory specimens (nasopharyngeal and throat swabs in viral transport medium, tracheal aspirates, bronchoalveolar lavage, or sputum) from 592 preschool children aged from three days to 72 months were included in to further analysis. Each of the 664 samples represented a different hospitalization event, except for one child from whom two different samples were taken and submitted for analysis (nasopharyngeal swab and bronchoalveolar lavage). Remaining 233 (26%) respiratory specimens were collected from 149 children either older than 72 months or were taken during the same hospitalization event. Therefore these specimens were excluded from the further analysis. Demographic and clinical data were extracted from the children’s medical records and were available for 37 HCoV-positive children and 395 HCoV-negative children. The present study was approved by the National Medical Ethics Committee, Ljubljana, Slovenia (no. 60/02/09). Total nucleic acids were isolated from 190 μL of each respiratory specimen using a total nucleic acid isolation kit on a MagNA Pure Compact instrument (Roche Applied Science, Mannheim, Germany), according to the manufacturer’s instructions. An additional 5 μL of equine herpesvirus 1 and equine arteritis virus isolates were included in the nucleic acid extraction as internal controls and were detected in separate duplex PCR reactions with other specific targets [9, 10]. The specimens were initially tested with direct immunofluorescence assays (DFAs; Oxoid, Cambridge, UK) for RSV, Flu A/B, PIV1-3, and AdV. After the routine detection assays, the remaining samples were stored frozen until their nucleic acid extraction. All four human coronaviruses (229E, OC43, NL63, and HKU1) were detected with a modified coronavirus consensus real-time RT–PCR assay performed on a StepOne Real-Time PCR System (Applied Biosystems, Foster City, USA) to amplify 85–100-bp fragments of the polymerase 1b gene . The real-time RT–PCR assays were performed as one-step reactions (SuperScript III Platinum One-Step Quantitative RT–PCR System; Invitrogen, CA, USA) within a single tube and a final volume of 20 μL, containing 5 μL of RNA and additional 6 mM MgSO4. The cycling conditions were as follows: 20 min at 50°C, 2 min at 95°C, and 45 cycles of 15 s at 95°C and 45 s at 60°C. All samples that were positive in the coronavirus screening assay were analyzed with a subtype-specific assay in which all the coronavirus species were detected separately . All the specimens were also subsequently tested with real-time RT–PCR for the presence of hRV , hMPV , and HBoV  using previously published assays. The relative quantity of viral RNA was estimated from the Ct values (cycle threshold; the cycle number at which the real-time fluorescent signal of the amplification target was above the background noise level) of the real-time PCR. A lower Ct value was interpreted as indicating a higher viral load. Categorical data are summarized as frequencies (%) and numerical data as medians (range). The association between age and HCoV viral load was assessed with a linear regression model. Restricted cubic splines  were used to flexibly model the relationship between Ct in the HCoV assays and patient age. The shape of the estimated association is presented graphically . We considered nine clinical characteristics (fever, oxygen support required, cough, rhinorrhea, dyspnea, wheezing, vomiting, location of the respiratory tract infection, and bronchiolitis) and used univariate logistic regression models with Firth’s correction to assess the association between HCoV positivity (covariate) and each clinical characteristic (response variables; these models are indicated as “models (a)” in the Results section). We further defined a three-category variable for the HCoV results: HCoV negative, HCoV positive with monoinfection, and HCoV positive with coinfection. We fitted an additional set of univariate models using the new variables as the covariates (“models (b)”). Only the first hospitalization for each child was considered in this analysis. The results are presented as odds ratios (OR) with 95% confidence intervals (95% CI) and P values. The R statistical language was used for the analyses . From June 2007 to May 2008, 664 specimens were collected from 592 children under six years of age with ARTI. The median age was 17.7 months (interquartile range: 9–28 months). The female: male ratio was 1:1.3 (256/592; 43% females). The 664 samples comprised 542 (81.5%) nasopharyngeal swabs, 102 (15.4%) throat swabs, and 20 (3%) other respiratory samples (i.e., tracheal aspirates). Overall, in 70.6% of samples, one or more viruses were confirmed with the combined results of RT–PCR and DFA. The prevalence of RSV, FluA, FluB, PIV1, PIV3, and AdV according to DFA was 12%, 0.1%, 0.1%, 1.2%, 0.6%, and 1%, respectively. PIV2 was not detected during the study. Human coronavirus RNA was detected in 40 (6%; 95% CI: 4.3%–8.1%) of the 664 samples, 33/40 (82.5%) in nasopharyngeal swab, 6/40 (15%) in throat swabs and 1/40 (2.5%) in bronchoalveolar lavage. Of the 40 specimens positive for coronavirus, 21/40 (52.5%) were HKU1, 7/40 (17.5%) were OC43, 6/40 (15%) were 229E, and 6/40 (15%) were NL63. All specimens were also tested with real-time RT–PCR for hRV, HBoV, and hMPV. The most common virus detected was hRV (37.6%), followed by HBoV (20.9%) and hMPV (11.3%). Most HCoV infections were detected in winter (22/40, 55%) and spring (10/40, 25%), whereas 6/40 (15%) positive samples were collected in autumn and only 2/40 (5%) in summer. The association between HCoV positivity and seasonality was statistically significant (P < 0.001). February had the highest number of HCoV-positive specimens (12/40, 30%), whereas HCoV was not detected in June or July (Figure 1). Seasonal distribution of positive results for coronavirus and other detected viruses. Of the 40 HCoV-positive samples, only 12 (30%) were shown to involve only one virus, including 3/6 229E, 2/7 OC43, 5/21 HKU1, and 1/6 NL63. Species 229E was most frequently detected as a monoinfection (50%), but one or more other viruses were identified in the majority (28/40, 70%) of coronavirus-positive samples: 21/40 (52.5%) were dual infections, 6/40 (15%) were triple infections, and four viruses were detected simultaneously in one infection (2.5%). The viruses most frequently detected with HCoV were hRV (42.8%), HBoV (32.1%), RSV (28.6%), hMPV (21.4%), and AdV (3.6%). 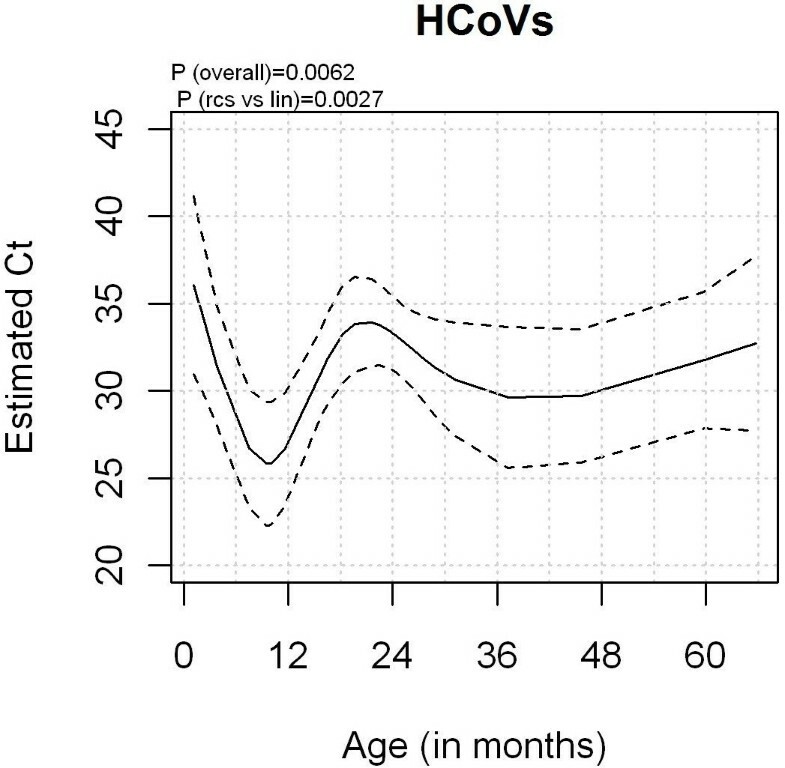 On average, children with HCoV infections were older than those negative for HCoV (median ages in months: 23 vs 18 months, respectively), but infection with HCoV and age were not significantly associated (regardless of whether age was treated as a continuous or a categorical variable; data not shown). However, age was associated with the estimated quantity of HCoV viral nucleic acids present (measured as Ct). The association was nonlinear (P < 0.001) and the highest estimated viral load (lowest Ct) was detected in children around 10 months old. The estimated viral load increased with age for children younger than 10 months, whereas it decreased between 10 and 24 months. The estimated shape of the association is shown in Figure 2. Estimated association between age and HCoV viral load (Ct). Clinical data were available for 37 (92.5%) of the 40 HCoV-positive specimens and for 395/624 (63.3%) of the HCoV-negative specimens. The majority (70.3%) of HCoV-positive children were diagnosed with lower respiratory tract infections (LRTIs: bronchiolitis 56.7%, pneumonia 13.5%, bronchitis 5.4%, and recurrent wheezing 8.1%). The remaining patients (29.7%) had URTIs. Oxygen support during their hospital stay was required by 17/37 (45.9%) HCoV-positive children and the median duration was three days. The symptoms associated with HCoV are shown in Table 1. Key: HCoV, human coronavirus; LRTIs, lower respiratory tract infections. The HCoV-positive children required significantly less oxygen support and had less cough, dyspnea, wheezing, LRTI, and bronchiolitis than HCoV-negative children (Table 2; models (a)). The differences in the clinical features of the HCoV-positive and HCoV-negative children were very similar to those observed between HCoV-positive children with monoinfections and HCoV-negative children (Table 2; models (b)), indicating that monoinfection with HCoV was associated with distinct clinical features. The only exception was the URTIs, which were more common among HCoV-positive children (28% for HCoV-positive children vs 5% for HCoV-negative children). Children with HCoV and coinfections had URTIs significantly more frequently than HCoV-negative children, and less frequently than HCoV-monoinfected children, the difference was statistically significant (P < 0.001) (4/10 = 40% among those with HCoV monoinfections, 6/26 = 23% among those with HCoV coinfections, and 18/373 = 5% among the HCoV-negative children). Key: The odds ratios and 95% CIs were derived from univariate logistic regression models. In models (a): the outcome is the presence of the specific symptom, HCoV positivity is the covariate, and the reference category is “HCoV positive”. In models (b), the outcome is the presence of the specific symptom, the covariate HCoV has three categories (HCoV positive with a monoinfection, HCoV positive with coinfection, and HCoV negative), and the reference category is “HCoV positive with monoinfection”. An underlying medical condition was present in 11/37 (29.7%) HCoV infected patients, whereas the other HCoV-positive patients in this group were previously healthy. Four children with underlying disease carried HCoV as a single pathogen. Species 229E was more likely to be detected as a single infection than were the other viruses. Conversely, HKU1 was more likely to be detected as a coinfection with other viruses than as a monoinfection in children with an underlying medical condition. More than one virus was detected in 76.9% of HCoV-positive children without an underlying disease or immunodeficiency. HKU1 was detected as the only viral pathogen in a nasopharyngeal swab and bronchoalveolar lavage from a 9.7-month-old child with bronchiolitis who was previously healthy. Because the number of cases in our study was small, no comparison of all the symptoms was made with a logistic regression model, nor was a comparison of the different coronavirus species and their associations with clinical symptoms possible. No differences were found between the CT values of the HCoV-positive samples according to the different clinical outcomes (data not shown). In our study, human coronavirus RNA was detected in 6% of respiratory samples from hospitalized children with ARTI. This prevalence was lower than we have found previously  and similar to that in other studies (from 2.6% to 8.7%) [17–20]. The majority of positive samples contained the HKU1 (52.5%) and the other coronavirus species were detected less frequently. A similar prevalence has been reported by Kuypers, and the prevalences of the HCoV species were reported in the same order . There may be regional and annual variations in the circulation of different coronavirus species, as have been described by others . HCoV was most often detected in winter and spring (80%), with the maximum number of cases presenting in February, whereas only 20% of samples were positive for HCoV in autumn and summer. Coronavirus infections have also been strongly associated with seasonality in previously published studies [20–23]. The children included in our study were under six years of age (median, 17.7 months). The probability of infection with HCoV was not significantly associated with age. However, the HCoV-infected patients in our study were older than those negative for HCoV. Some studies have included populations from all age groups [21, 24, 25], and coronaviruses have been detected in adults [26–29], young children [30–34], and neonates . The association between age and the estimated viral load (from the Ct value) was interesting. The highest viral load was estimated for children about 10 months old (lower viral loads were detected in HCoV-infected children younger or older than 10 months). One reason for the highest viral load at this age may be the presence of maternal antibodies directed to HCoVs in younger infants . The small number of cases and high number of HCoV coinfections with other respiratory viruses limited our ability to determine whether specific clinical signs or symptoms were associated with coronavirus infections. We compared only group of children infected with HCoV and those without HCoV infections. In our analysis children negative to all tested viruses were not included, because there is still uncertainty about possible infection with some of the newly described viruses (which were not included in our testing array). Children infected with HCoV required significantly less oxygen support, and had less cough, dyspnea, wheezing, LRTI, and bronchiolitis than the HCoV-negative children. URTIs were more frequent among HCoV-positive patients with monoinfections than among HCoV-negative children. As in other similar studies, we had only a relatively small number of coronavirus-positive samples. So far, only a few studies have included sufficient patients to permit a statistical comparison of the clinical outcomes of infections with different HCoV species [19, 21, 37]. It has recently been reported that coronavirus-infected children have LRTI less frequently than those infected with other viruses . Children with coinfections had less severe disease than those with single virus infections. Children under 5 months of age had higher prevalence of single virus infections than older children . In other recently published study the patients with coronavirus and influenza A virus coinfections had more severe disease than those with influenza virus infection only . In the majority of our HCoV-positive specimens (70%), at least one other viral nucleic acid was present. To distinguish possible differences in the clinical presentations of children with a single infection from those of children with coinfections, and between the clinical presentations of infections with specific HCoV species, a study with more patients is required. All HCoV-positive children included in our study were hospitalized with ARTI: 70.3% had LRTIs and 29.7% had URTIs. Pneumonia was diagnosed in 13.5% of children and 56.7% of children had bronchiolitis; 29.7% of HCoV-positive children had an underlying medical condition. As reported by others, single infections with HCoV were more often detected in children with an underlying medical condition than in previously healthy children: 5/11 (45.4%) vs 6/26 (23.1%), respectively . In children with an underlying disease, the 229E was more often detected as a single infection than as a coinfection, whereas the HKU1 was more often detected as a coinfection. Our study also contains several limitations. Due to the retrospective nature of the study, clinical data were not available for all included patients due to the noncomprehensive or missing clinical documentation. The reasons for the missing clinical data were that children were hospitalized due to the respiratory tract infection but were not stationed in pulmonary department and were distributed to other departments of the children's hospital because of the overcrowding. For these patients the clinical records were not available to investigators. Another limitation of this study is the fact that different samples were taken in some of the patients i.e. oropharyngeal instead of nasopharyngeal swab) and this could influence the yields of coronavirus (as well as other respiratory viruses). However due to the retrospective nature of the study we couldn't influence the sampling descisions made at the clinic. The politics of sample collection in place was that nasopharyngeal swab is preferred as the optimal sample but in cases where the physical or psychological conditions of the patient would not allow for safe nasopharyngeal swab collection, the laboratory would accept the oropharyngeal swab. The samples such as tracheal aspirates or BAL samples were collected from the severly affected children. All samples originated from hospitalized patients and that can also be considered as source of selection bias. Samples from outpatients and healthy control group children would be desirable in the study to determine HCoV prevalence and clinical features more accurately and also to exclude the possibility that viruses are detected as “contaminants” or “normal flora”. Due to the retrospective nature of the study, follow up testing was not performed. At the time of the study, detection of respiratory viruses was routinely performed by DFA instead of PCR which might underestimate the true prevalence of infections. However, we believe that these differences in sensitivity are not very prominent, especially in regard to detection of RSV virus and the fact that the study population represents young children in which DFA has best sensitivity. In conclusion, we found that all four non-SARS coronavirus were detected with ARTIs in hospitalized children in Slovenia and that their identification with routine diagnostic techniques is feasible. An association between age and the viral load was found. The highest viral load was detected in children approximately 10 months of age. Further investigation of HCoV, with the inclusion of a control group of healthy children, is required to better understand the clinical importance of HCoV in respiratory infections. This study was supported by the Slovenian Research Agency (Research Program P3-0083) and institutional department funds. MJ and MP created the original idea of this research. MJ, TU, LL and MP designed the whole experiments and conducted analysis and interpretation of the data. NŽ, and UK participated in partial research work. All authors read and approved the final manuscript.